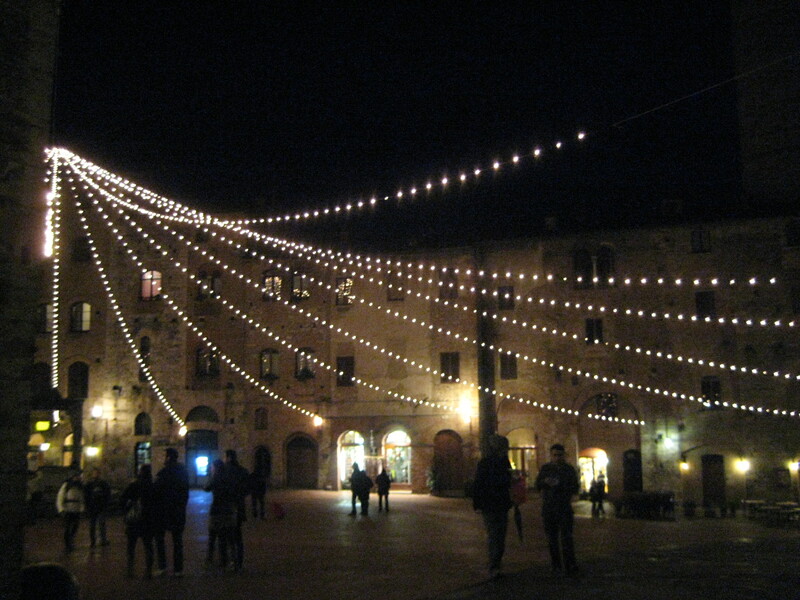 San Gimignano is a small town in Tuscany, about an hour by bus from Florence. 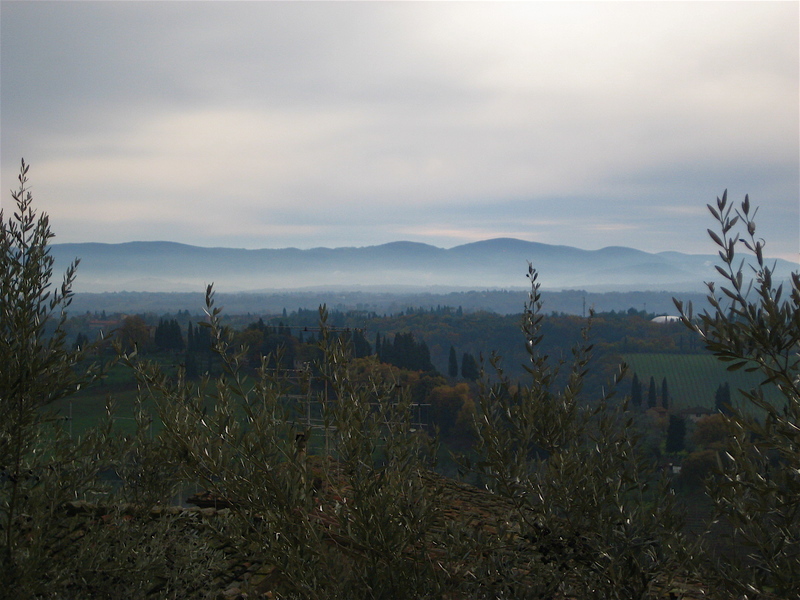 Given its key location in between Florence and Siena, it was once an important stop on the Medieval pilgrimage route, and the center of two warring factions in the 12th century. At the height of its power, the many wealthy families in town built a total of seventy towers to showcase their wealth and power–also referred to as the “original skyscrapers” by locals. Today, the 14 remaining towers are a testament to the city’s ability to withstand war, weather, and time. Although traveling during the winter means imagining what the countryside might actually look like when things are lively and green, the slightly eerie empty fields create a very beautiful but ghostly effect. The town is surrounded by a large fortress-like medieval wall, that shelters the most picturesque little Italian town. This was the peace and quiet we had been looking for! Besides the occasional tourist and/or local milling about, there was pretty much nobody and no cars in sight. 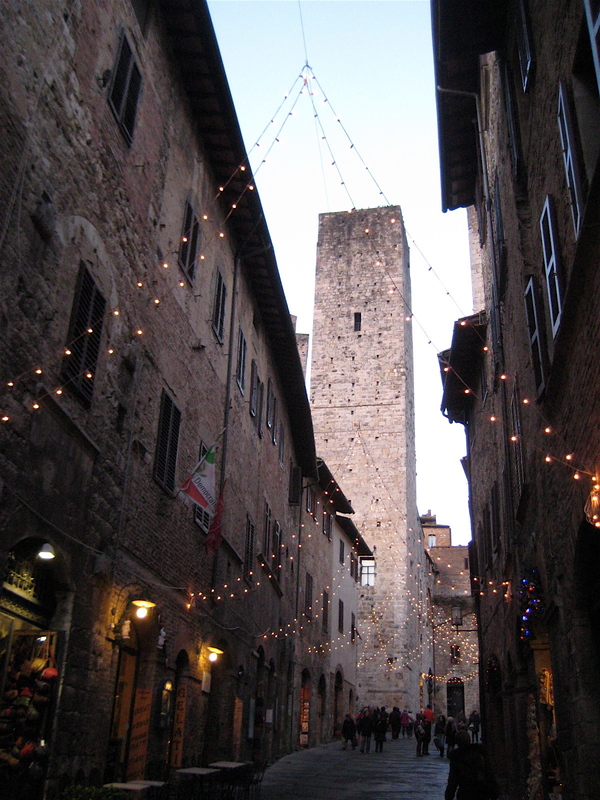 In fact, the one prevailing sound within the entire 10 mile radius of San Gimignano was that of the thunderous wheels of my friend B’s little suitcase as they rolled and echoed loudly over each and every bumpy cobblestone across town– much to the dismay of all the locals who peered at us from their windows because they probably thought a space shuttle was blasting off dangerously close to their town. B and I couldn’t stop laughing hysterically at our sad/hilarious tourist attempt. There were plenty of leather and food specialty shops along the main road, where there were about ten people (and plenty of boar heads)…Tuscany is all about the wild boar (cinghiale)! 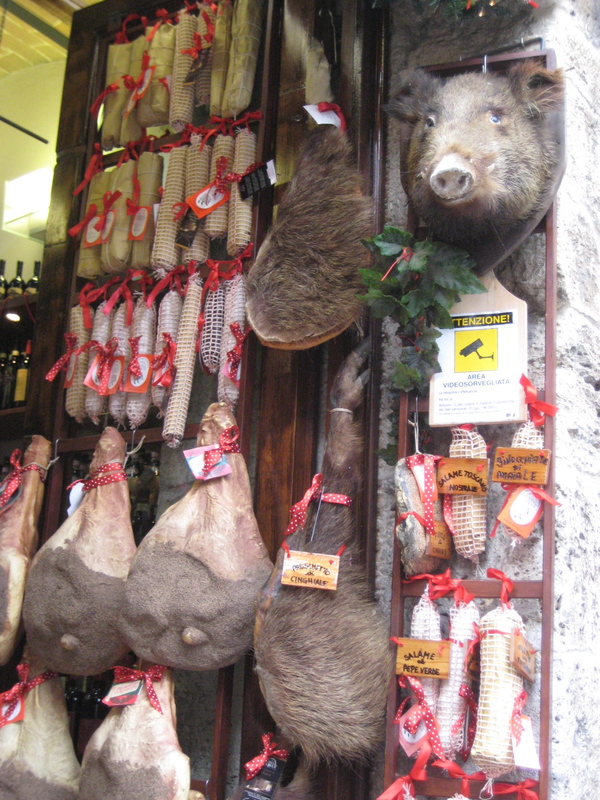 Wild boar prosciutto, salami, and meat can be found at various specialty shops all over town. 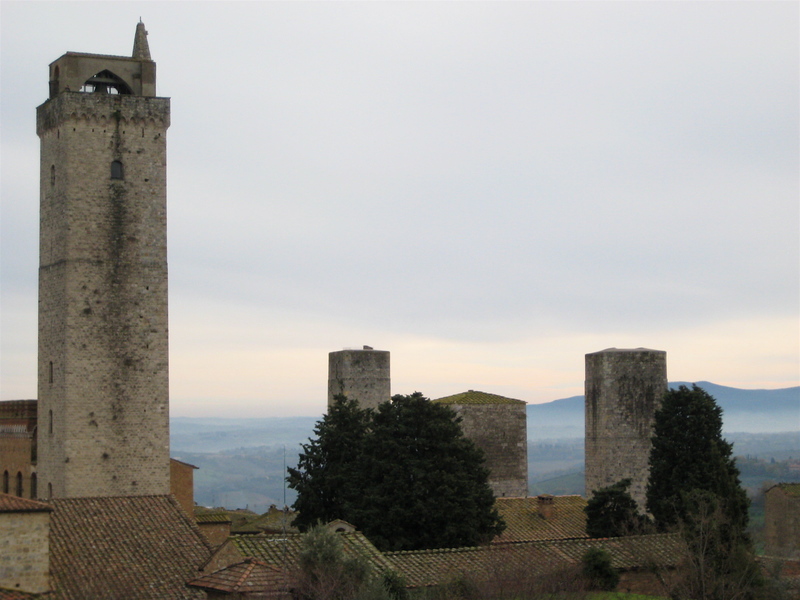 There are several points around San Gimignano with panoramic views of the countryside. The tallest tower measures approximately 54 meters (a bit more than 10 stories), and is one of the main attractions in town, as you can climb a decent amount of stairs to the top for magnificent photo ops of the San Gimignano skyline and a chance to count all 14 towers. Beware of the steps down though– I’m not very afraid of heights but I did have trouble going down the stairs because they are made of see-through metal grates! It got dark pretty quickly, and B and I tried to find something to do after our amazing dinner– to be detailed in my next post. It was dangerously cold out, but we put on our extra pairs of socks, sweaters, and ventured out to find something to do. By this time of the night, the streets were completely deserted because all of the smarter people were nice and warm at home or in their neighborhood restaurant. We were already full and all the stores were all closed, so we ducked into a local wine shop that was about to close and found an Italian family completely settled into what seemed to be their permanent seats at the bar, relaxing and chatting animatedly. We asked for a recommendation for an inexpensive bottle of local wine and retreated back to our hotel room, where we watched a bizzaro vintage Italian movie on the only tv channel that worked. I loved that the feeling of having only two options in front of me for once– to either stay outside in the freezing cold with multiple layers of socks or to stay inside in a warm hotel room and decipher the plot of a 1970s romantic comedy that suddenly turns into a dark murder film at the last second. Wouldn’t you have done the same? Looks like an absolutely beautiful place to visit, must add to the list! Hi Marcus, thanks very much for visiting and commenting! I’ve always wanted to check out Sardinia- let me know if there is any food there I should be looking into!